Arthroscopic Capsular Plication is a minimally-invasive surgery is used to relieve pain and loss of shoulder stability for patients with loose shoulder. A radiofrequency (RF) probe is inserted into the shoulder to stimulate the tissue capsule that surrounds the shoulder joint. This causes the tissue to contract, tightening the shoulder joint. This arthroscopic procedure is performed at an outpatient surgery center. The patient usually goes home the same day. Several nick incisions are made around the shoulder. 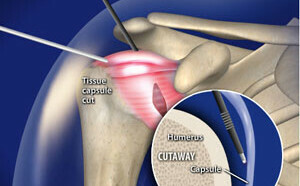 The procedure consists of tightening the tissue capsule of the shoulder joint with strategically placed sutures. This serves to stabilize a shoulder that is loose. A sling is worn postoperatively. Physical Therapy is helps to obtain an optimal outcome. Your doctor may recommend shoulder arthroscopy if you have a painful condition that does not respond to nonsurgical treatment. Nonsurgical treatment includes rest, physical therapy, and medications or injections that can reduce inflammation. Inflammation is one of your body’s normal reactions to injury or disease. In an injured or diseased shoulder joint, inflammation causes swelling, pain, and stiffness.